Arsenal reached back to back Continental Cup finals on Thursday night, as they beat Manchester United 2-1 at Meadow Park. 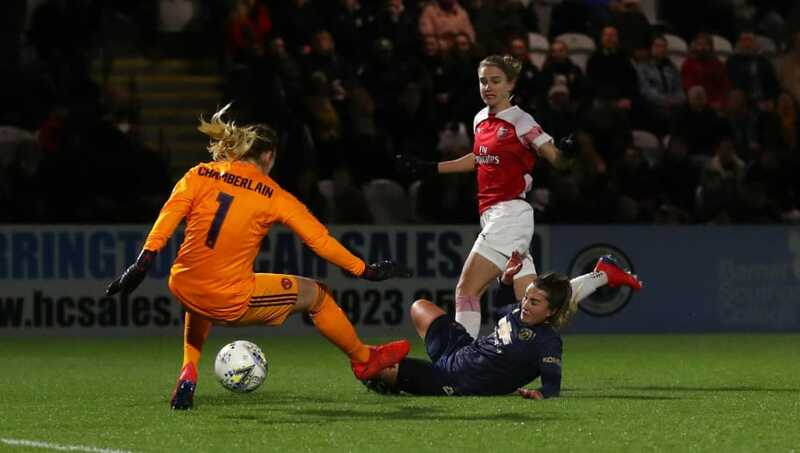 The Gunners took the lead in the 18th minute, as Vivianne Miedema slotted the ball past goalkeeper Siobhan Chamberlain. However, while Miedema finished the move, the goal was made by Dominique Bloodworth, who played a wonderful pass from her own half to put it on a plate for the scorer. Miedema doubled Arsenal's lead just before the hour mark, as she got her second goal of the night. The Dutch forward brought it down inside the box and fired the ball home to give the hosts a comfortable lead at Meadow Park. Manchester United deservedly pulled one back seven minutes from time, as Mollie Green drilled her shot into the bottom corner from the edge of the box. However, it wasn't enough for the Red Devils, as the hosts held on to progress to the Continental Cup final for a second year in a row. Arsenal will now play Manchester City in the final, after they beat Chelsea 2-0 on Wednesday night. The match, which is a repeat of last year's final, will be played on 23 February at Sheffield United's Bramall Lane. ​​Arsenal were outstanding on the night, and thoroughly deserved their place in the final. Sitting second in the Women's Super League with a game in hand, the Gunners showed their class and experience in a professional performance, as they played some fantastic football on the night. The Gunners have now reached the final in seven of the eight editions of the tournament, which is a truly remarkable feat for Joe Montemurro's side. They showed why they're one of the best teams in the country, and will be eager to win their sixth Continental Cup title later this month. Starting XI: van Veenendaal (7); Arnth (6), Williamson (6), Quinn (7), Mitchell (6); Bloodworth (7), Little (8), Van de Donk (7); Mead (6), Miedema (8*), McCabe (6). STAR PLAYER - Scoring both of Arsenal's goals, Vivianne Miedema put in an excellent performance for the Gunners. The Dutch international kept her cool and finished fantastically on both occasions, as her goals helped the north Londoners into another major final. Miedema's brace at Meadow Park comes as no surprise when looking at her incredible stats this season. She has now scored a fantastic 25 goals in 19 appearances, and is the top goalscorer in the Women's Super League. It was an inch perfect performance, as she stood out for Arsenal. ​​Manchester United put up a good fight against one of the strongest teams in the country, and although they were outclassed they definitely produced a performance that they can be proud of. They played good football and, in the end, were unlucky to bow out of the cup. Despite defeat, the Red Devils deserve huge credit for reaching the semi-finals of the competition. The Championship side were only formed eight months ago, and a last four appearance in their debut season shows huge potential for the forseable future. Starting XI: Chamberlain (6); Harris (6), A. Turner (6), M. Turner (5), Smith (6); Greenwood (6), Zelem (6), Green (6); James (7), Galton (6), Sigsworth (6). Substitutes: Hanson (6), Toone (6), Arnot (81'). STAR PLAYER - At just 17-years-old, Lauren James had an excellent game for Manchester United. She was the key in every United attack throughout the game, and although they fell just short she certainly produced a performance to be proud of on one of the biggest stages there. Arsenal next face an FA Cup tie, as they travel to Kingsmeadow to play Chelsea on 17 February. They then return to league action three days later, hosting Yeovil Ladies at Meadow Park. Manchester United now turn their attention to the Championship, starting with next Wednesday's trip to Leicester City. They then have another week before their next fixture on 20 February, when they visit Sheffield United.